These beautiful Apache Gahn Dancer earrings were hand crafted and attributed to well-known Zuni artist Vera Luna. The incredibly fine inlay features materials of turquoise, black jet, pen-shell, white Mother of Pearl and red abalone shell. 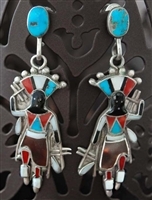 This pair offers the best of Luna's work, with the distinct, detailed design and precise inlay work. Several of the stones are raised inlay. The hand crafted top portion of the earrings are sterling screw backs. Top materials were used to make these beautiful earrings. The earrings hang 2 1/4" by 1/2" wide. Not hallmarked, which was common during this era.